Chromosomal single-strand break repair rates in the indicated RPE-1 cell lines following treatment with 50 μM H2O2 in the presence/absence of 10 μM of the PARP inhibitor (PARPi) Veliparib, as measured by alkaline comet assay. Data are the mean tail moment of 100 cells per sample per experiment and are the average (-/+SEM) of three independent experiments. Two-way ANOVA analysis between relevant genotypes is presented (ns= not significant, **= p<0.01, ***= p<0.001). Immunoblot analysis of PARylation after treatment with various PARP inhibitors.The asterisk indicates a nonspecific band. DNA damage persists on withdrawal of PARPi in RNASEH2AKO cells. Wild-type and RNASEH2AKO HeLa cells were treated with talazoparib and released into fresh medium for the indicated times before being processed for γ-H2AX immunofluorescence and propidium iodide (PI) staining. The γ-H2AX immunofluorescence (pseudocolor plots) and cell cycle (histograms) FACS profiles shown are representative of three biologically independent experiments. 4-Hydroxyquinazoline is a PARP inhibitor with a high potency for PARP-1 and no effects on enzymes other than PARP. Pamiparib (BGB-290) is a potent and selective inhibitor of PARP1 and PARP2 with IC50 values of 0.83 and 0.11 nM, respectively in biochemical assays. It shows high selectivity over other PARP enzymes. INO-1001 is a potent inhibitor of PARP with IC50 of <50 nM in CHO cells and a mediator of oxidant-induced myocyte dysfunction during reperfusion. Phase 2. Propofol inhibited the increase of PARP-1׳s expression and activity. Mice (n=6) were injected intraperitoneally with propofol, INO-1001 (a PARP-1 inhibitor) or equal volume of normal saline (NS), and then were trained with objects. Naïve animals were injected with normal saline and trained without objects (the same as habituation). 30 min after acquisition trial, the hippocampal tissues were harvested for determining PARP-1 (A and B) and PAR (C and D) expression by Western blot. Histogram represented the relative level normalized to naïve. *P<0.05, **P<0.01. Effect of PJ34 treatment on expression of IL-1ß, IL-6 and TNF-α at 24h after SAH. (A) Representative Western blots showing levels of IL-1ß, IL-6 and TNF-α. (B)-(D) The relative band densities of IL-1ß,IL-6 and TNF-α. The densities of the protein bands were analyzed and normalized to ß-actin. The bars represent the mean±SD. n=6. *p<0.05 vs sham, #p<0.05 vs SAH+Vehicle. Niraparib (MK-4827) is a selective inhibitor of PARP1/2 with IC50 of 3.8 nM/2.1 nM, with great activity in cancer cells with mutant BRCA-1 and BRCA-2. It is >330-fold selective against PARP3, V-PARP and Tank1. Phase 3. 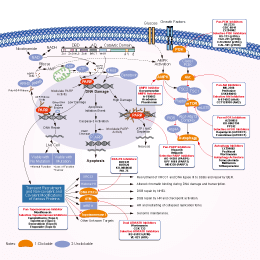 UPF 1069 is a selective PARP2 inhibitor with IC50 of 0.3 μM. It is ~27-fold selective against PARP1. AZD2461 is a novel PARP inhibitor with low affinity for Pgp than Olaparib. Phase 1. J Cancer Res Clin Oncol, 2019, 145(1):137-152. Colony survival assay in wild-type A549 cells treated with vehicle, 3.0 μM ME0328 or 500 nM KU58948 and pyridostatin. Niraparib (MK-4827) tosylate is a selective inhibitor of PARP1/PARP2 with IC50 of 3.8 nM/2.1 nM. NVP-TNKS656 is a highly potent, selective, and orally active tankyrase inhibitor with IC50 of 6 nM for TNKS2, > 300-fold selectivity against PARP1 and PARP2. E7449 is an orally bioavailable, brain penetrable, small molecule dual inhibitor of PARP1/2 and also inhibits PARP5a/5b, otherwise known as tankyrase1 and 2 (TNKS1/2), important regulators of canonical Wnt/β-catenin signaling. It has IC50 values of 1.0 and 1.2 nM for PARP1 and 2, respectively. Benzamide, an inhibitor of poly(ADP-ribose) polymerase, is a derivative of benzoic acid. Picolinamide is found to be a strong inhibitor of poly (ADP-ribose) synthetase of nuclei from rat pancreatic islet cells.